Hello there fellow scotch addict! One of our primary goals here at ScotchNSniff is to bring you suggestions that are focused on value. We like the idea of bringing a suggestion to you that we can stand behind (and almost more importantly, one we can enjoy ourselves!). Most people try to place scotch into two piles; one, for the rich and one for the rest of us… but in reality, value exists across the spectrum of scotches in spite of price and regardless of your budget. It’s the biggest reason we do a Christmas suggestion list each year, knowing that not everyone can afford to spend a grand on a bottle but almost anyone can come up with fifty bucks for a special occasion. 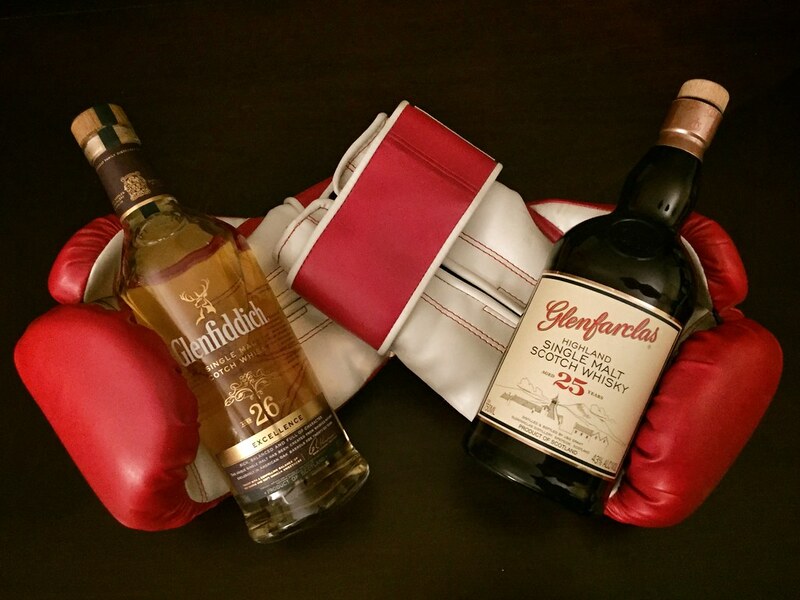 Today though, we’re going to pit a $500 bottle of Glenfiddich Excellence 26 year against the 25 year offering from Glenfarclas that carries a price tag of $225. At literally less than half of the price of the Glenfiddich, this might seem like a strange comparison but considering the whisky in the barrels took almost the same amount of time to age, it may be difficult to justify the difference in price. In typical SnS fashion, it’s time to get on with the CNPF reviews! COLOR: The Glenfarclas has a gorgeous wheat color where the Glenfiddich is a surprisingly light color, resembling white grape juice. NOSE: The Glenfarclas smells strongly of spices commonly found in Sherry. Do yourself a favor, if you’ve never smelled Sherry and want to recognize it every time you smell it, grab a bottle of Pedro Ximenez (PX) Sherry and enjoy! It pours like motor oil, looks like used motor oil, and tastes like heaven! (I’m a big port fan, so fortified wines are some of my closest friends!). Nosing the Glenfiddich, after the Glenfarclas sherry monster, you’ll notice a bit of smoke that ties the fruity and floral notes together. It’s definitely a sweeter nose versus the spicy Glenfarclas. PALATE: Imagine a candy cane that’s had almost all of its mint removed but still retains that sugary candy cane sweet flavor. Now melt that flavor into a velvety butter and place it on your tongue. Now roll it around finding some smoke and some vanilla mixed into softly charred oak along the way. Now breathe in deep the spices and oak. If you read that with your imagination, you just tasted the Glenfiddich 26. Now imagine a tannic sherry (really) with its slew of spices setting up base camp on your tongue. Christmas spices have found a place near the middle of your tongue. Pepper parked itself near the back of your tongue. Cinnamon, nutmeg, and Christmas have found their way to the tip of your tongue. Now imagine all of these camps suffered from a massive landslide into your gullet as you sip them down. I hope you love sherry because it’s your new best friend! FINISH: The Glenfarclas 25 finishes with hints of fresh chocolate, like you’d smell at the Hershey factory… and that chocolate just melted into a bowl of sherry. This is wonderful. The Glenfiddich 26 has a wonderful finish that starts with spice and oak, but slowly and linearly gives way to fruit sugar. Quite tasty. So who wins out? Who wins this installment of SvsS? As I’ve said with other SvsSs, you can’t actually go wrong with either of these bottles. It’s a matter of personal choice when you’re looking for a specific flavor to enjoy when you sit down with a dram. If you’re looking for value though, it’s difficult to say the extra year in oak bourbon barrels is worth the $275 price difference. If you love sherry and Christmas spices, you can pick up two bottles of the Glenfarclas AND a bottle of Glenfiddich’s fruit-bomb-that-is-its 12 year for the same price as the 26 excellence. Again though, we’re talking a very different set of flavors. The Glenfiddich 12 isn’t in the same league when it comes to complexity of flavors though it is very good. It’s just different and in a different world of value. So which would you choose? What do you think about this comparison?